Shara Shara The Veiled Beauty is a sleeping mask, but it’s totally unique to any other sleeping mask on the market. Korean sleeping masks are designed to give skin an extra dose of hydration while you sleep. I’ve tried several types of sleeping masks (reviews will come! ), and I found that most of them are not as hydrating as I hope for how dry it is in the winter. The Veiled Beauty is the only mask that is hydrating enough for me. It’s mid-winter in Chicago right now, and today, as I write, the windchill factor makes it feel like -20F outside (-29C). This weather outside is insanely dry, and inside is just as dry because of the constant heat pumping through the vents. In the past, to compensate for this intensely dry air, my skin would overproduce sebum, resulting in extremely oily skin, with bad acne and enlarged pores. But now, to keep my skin happy and healthy, I load on the moisturizers like nobody’s business. 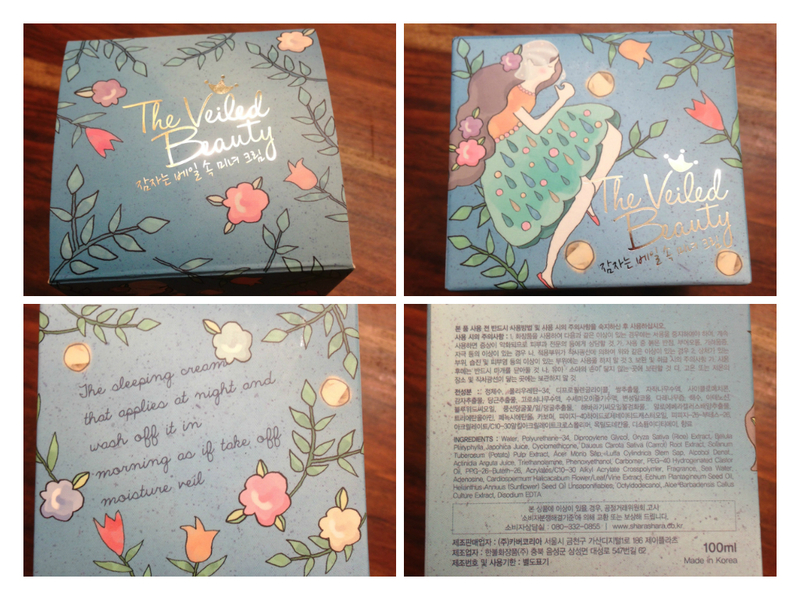 And now, at night (and sometimes during the day), Shara Shara The Veiled Beauty is a crucial last step in my routine. Crucial not only to lock in moisture, but also to lock in all the benefits from my other treatments, and to heal my skin. Ok, so what makes this sleeping mask so unique? The ingredients! Ingredients: Water, Polyurethane-34, Dipropylene Glycol, Oryza Sativa (Rice) Extract, Betula Platyphylia Japonica Juice, Cyclomethicone, Daucus Carota Sativa (Carrot) Root Extract, Solanum Tubersosum (Potato) Pulp Extract, Acer Mono Sap, Luffa Cylindrica Stem Sap, Alcohol Denat, Actinidia Arguta Juice, Triethanolamine, Phenoxyethanol, Carbomer, Peg-40 Hydrogenated Castor Oil, PPG-26-Buteth-26, Acrylates/C10-30 Alkyl Acrylate Crosspolymer, Fragrance, Sea Water, Adenosine, Cardiospermum Halicacabum Flower/Leaf/Vine Extract, Echium Plantagineum Seed Oil, Helianthus Annuus (Sunflower) Seed Oil Unsaponifiables, Octyldodecanol, Aloe Barbadensis Callus Culture Extract, Disodium EDTA. I ran the ingredients through cosdna.com, and I’m happy to report that there’s nothing in there that would cause acne for most people. Happily for me, it also doesn’t include acne-triggers for my skin like cetyls, stearyls, shea butter and other solid oils. It has a decent amount of plant extracts and moisturizers. But by far, the most important ingredient in it, and the reason this product is so unique, is Polyurethane-34. I will admit, when I first read that this product had Polyurethane-34 as it’s second ingredient, I thought “Yikes! Polyurethane! That’s the varnish they put on wooden floors to protect them. There is no way that’s good for your skin!” But I did some research on this ingredient, and what I found made me happy and excited to use this product. Polyurethane-34: Developed by Bayer for both medical and cosmetics purposes, this ingredient (AKA Baycusan C1000) creates a thin, breathable film on the skin. It helps wounds heal faster because it can protect the skin from bacteria and other outside elements, all while allowing the skin to breath. This ingredient can also help heal acne faster when used with an acne-fighting ingredient like salicylic acid (you can read Bayer’s test results and see pictures here). Overall, this ingredient is fantastic for cosmetics and skin care because it creates a barrier, locking in moisture and other beneficial ingredients into the skin. Polyurethane-34 is a relatively new ingredient, and so far it’s not used in many products. I love the fact that Shara Shara used it in a sleeping mask, because I think it’s perfect for that! It helps to lock in moisture, protect your skin from bacteria, and it also locks in all those beneficial ingredients from essences, serums, and ampoules into your skin while you sleep. This is an amazing ingredient, and in the near future, I predict there will be a LOT more products that will include polyurethane-34 as an ingredient. So let me move on to the product itself! 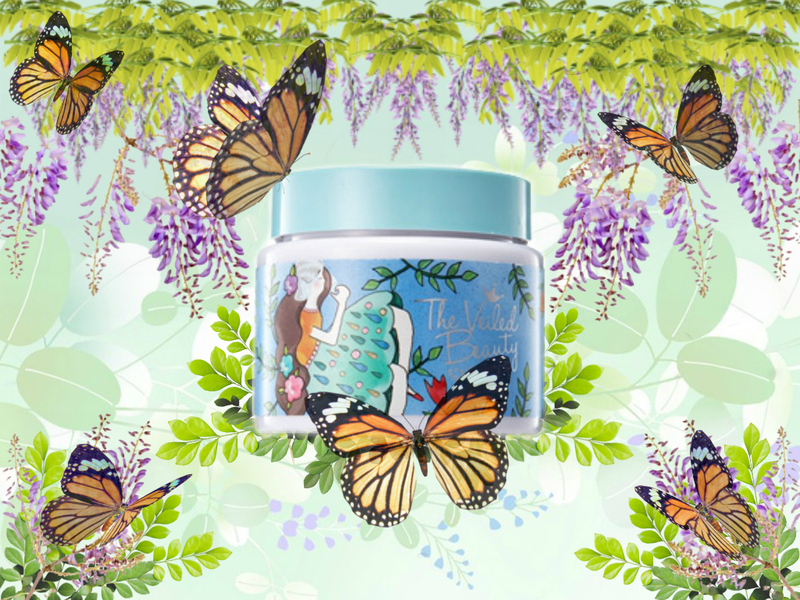 The Veiled Beauty comes in two different types: moisturizing and nutrition. 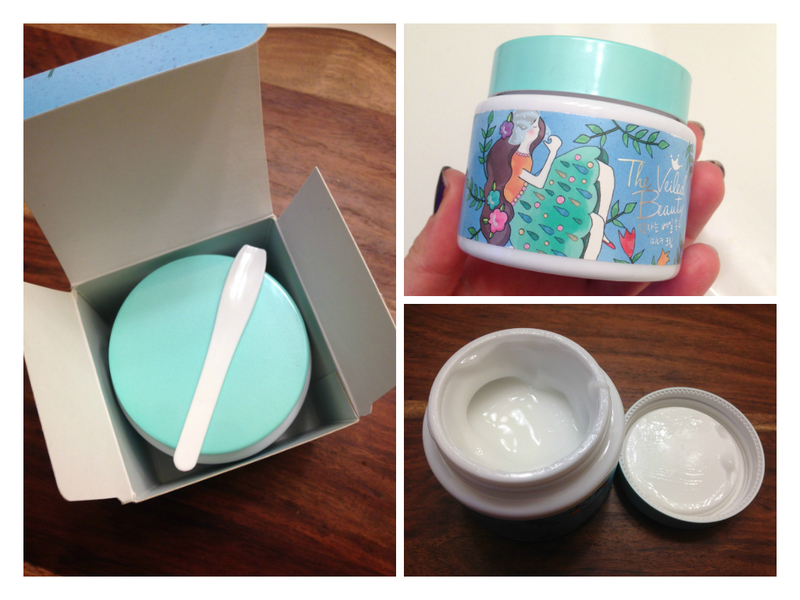 I have been using the moisturizing type, which comes in the blue packaging. This sleeping mask is a white, slightly gooey moisturizer that comes in a heavy plastic jar. There’s a little spatula to help scoop out the product, but I personally just like to use clean hands. I normally don’t like cutesy products, but I really love some of Shara Shara’s recent designs, and this product is definitely very pretty on my bathroom counter. The consistency of this sleeping mask is very thick and gooey (almost like a thicker version of Mizon all in one snail repair cream). The instructions say to spread a thick amount on the skin, so I put enough on to leave a little bit of white product all over. It has no fragrance added, which I personally prefer, and no strong smell to it. When you spread it onto your face, it feels a little cold, and extremely wet. I’ve grown to love that wet feeling because it just feels like an extra boost of moisturizer on my skin. It dries quickly though, despite putting a lot on my face, it’s usually dry to the touch within about 10 minutes. 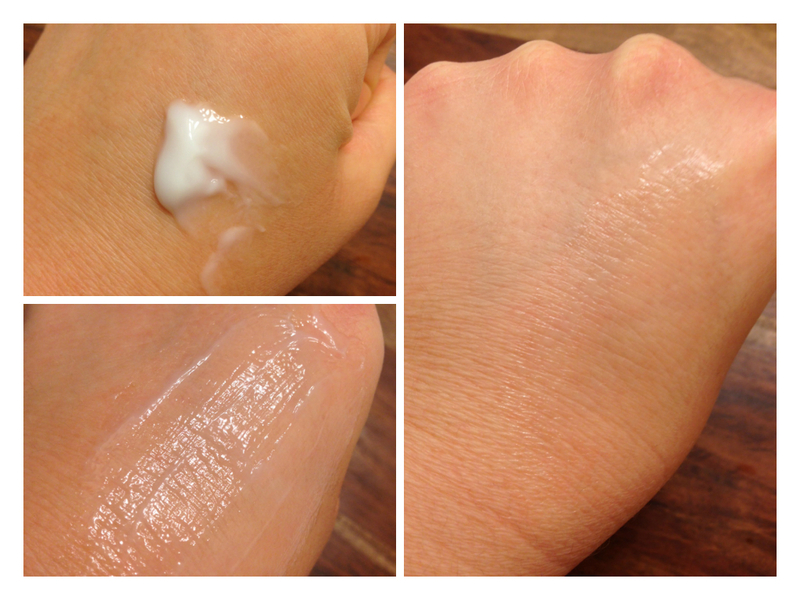 Once dry, it does leave your skin a little shiny looking, but not too bad! I have no problem walking around outside for a quick errand if I put it on during the day. 1) Wet hands thoroughly and press it into my skin. Immediately, you’ll see the white protective layer on your face. 2) With your fingers, rub the mask off in an outward motion. It won’t come off in one clean sheet, but it little pieces. Make sure you lean over your sink when you do this because the pieces will fall off. 3) As it dries, gently brush the remainder of the mask off with tissue or paper towel. Don’t forget to clean up the product that ended up in your sink, because it will clog the drain. 4) Then double-cleanse your face to get any remainder off! Yes, it’s a lot of steps to get this sleeping mask off, but I promise it’s worth it! Immediately after washing it, you will see your skin plump, moisturized, and healthier looking than ever! I’ve only used this product for a little over a week, but I love it so much that I couldn’t wait to blog about it! The first day that I wash it off, I noticed my rosacea was gone. GONE. For the first time in years, the ever-present red in my cheeks had completely disappeared! Unfortunately, my cheeks got a little red again at the end of the day, but once I put this sleeping mask on again, it’s gone. While I have this mask on, my skin is protected from any outside elements that may irritate my sensitive skin. And everyday over this past week, I’ve noticed the redness gradually improving over the day and my skin feels thicker and more resilient from the extra hydration provided by this mask. Also, I had a recent breakout from testing a new product, and this mask helped clear up my acne in a day. I’m not joking: ONE day. I had about a dozen small comedones and red inflammation popping up one day, but after putting this mask on as my final step at night, I woke up to all the red spots gone and only a couple comedones that easily came out. Amazing! Based on the intensive hydrating results and the immediate benefits to both my acne and rosacea, I know that this product will help many different people with all different types of skin! Whether you need extra hydration, or you want to heal your acne or rosacea quickly, or you want to increase the benefits of your other products for your skin, this sleeping mask will do all that and more. Get yourself a jar of this amazing product now. Pros: GREAT ingredient list, does everything that it’s supposed to and more! Cons: A little tricky to get off cleanly, but results like this, who cares? C’mon! I’ve become obsessed, that I really need to get this cream (because of your review), but shipping to Europe is twice as much expensive than cream itself. I don’t know if it is worth it, or should I wait that it becomes more widely available. I am quite new in Asian skin care routine (one month), and I really love it, but still I can not find anything that would sufficiently moisturise my extremely dehydrated skin with hormonal acne. Everything that I get, just evaporates from my skin in less than 2 hours (same goes for western products). Thanks, Loki! I’m glad you like my blog. And yeah, the veiled beauty is pretty amazing at sealing in moisture. But please wait another month before purchasing it. Because I’m in the middle of retesting this product. After using it for 2 months and finishing the jar, I noticed that I had little teeny tiny red bumps on my cheeks (not acne, but something else). I suspect that it may be from this cream and my inability to COMPLETELY remove the product off from the night before (it is difficult & annoying). And I’m afraid that my skin is reacting to build up. So… I’ve stopped using it for now, and will go back to trying it again soon. The little red bumps have disappeared, so I’m going to see if they come back when I use this cream again. I don’t know if the red bumps are from this product or something else that I’ve been testing (I’m always trying new things!) but I thought I should retest it just in case. In the meantime, I’ve been using petrolatum (Vaseline) as a last step at night. Not glamorous, but it works. It will NOT cause acne, and it’s great at sealing in your moisture barrier and keeping bacteria out. The key is to use a LOT of it as your last step. I layer it on thick! And when I wake up my face is still nicely moisturized. In the US, we have Vaseline (100% petrolatum), and I’m sure you can find a cheap version wherever you are too. If you want to go fancier, try Estee Lauder’s Eight Hour Skin Protectant. It’s just petrolatum with a few other things added in. Thanks so much for this reply. I will definitely try first with Vaseline and wait a bit for this mask before I ordered it. Beeing new to korean skincare is so exciting, but I definitely already spend way to much, and not even everything arrived yet. So better start slowly testing everything. Switching into low pH territory was the best thing I have ever done for my skin. Acne are slowly getting better, now I just have to do something about leftovers pigmentation marks and dry skin and big pores. Your suggestion about Vaseline surprised me, but I did some research and looks like it is really the thing. I have done a lot of reading about products but I always skiped Vaseline, because I just assumed that gressy thing should be acne triggering. What a nice surprise about such cheep product. Thank you. Completely unrelated: when you will be doing review on Missha first essence, could you include how does it compared to Mizon essence. Latter this year I will probably be purchasing one of those and I am courious if Missha is really worth to spend $20 more on. When I do the Missha First Essence review, I will compare it to the Mizon essence, thank you for the suggestion! Hopefully I will get to it soon. Good luck, and thanks for reading! BTW, make sure you get the pure 100% petrolatum original version of vaseline. Obviously, I don’t know your skin, but petrolatum is generally considered to be super mild and safe. Just remember to double-cleanse with an oil cleanser (Korean style) in the morning afterwards! Thanks so much for your review. Got rather excited about this wonder mask but I can’t find it anywhere […disaster, no less!]. Can you recommend a website? Unfortunately it seems they are no longer manufacturing it!!!! The horror!!!! Hello there! I am wandering where you buy this now it has been discontinued on koreadepart.Com? 😦 just stumbled on your blog yesterday and I’ve been reading so much lol you are awesome!